Although the course focuses on costume and set design for shows, films and new performance disciplines, the skills you learn will prepare you for a wide range of other careers. In your first year at AUB, we aim to give you a solid grounding in both Performance Design and Costume Interpretation. This will help you to experience the creative process of both designing and interpreting designs. The first unit is focused on core skills and aims to introduce you to a wide range of sewing techniques, including making the male and female blocks, boning and many seams and fastenings. Design-orientated projects include life drawing, costume design processes and scale model making, as well as looking at the contextual and theoretical issues around the subject. The Exploring Design unit asks you to develop a performance design through the study of a text. This unit investigates the designer/performer/audience relationship in a given space and culminates in a full set of sampled costume designs and scale set model. Our Costume for Screen unit allows you to see the complete costume interpretation process- right through from measuring performers to working on location on a period film. On this module, you’ll have the chance to work with a professional film costume designer and interpret their designs. The year culminates in the production of a short film on the course, featuring your costumes and in which you also have the chance to perform. Your second year begins with a choice of two units: Creative Realisation: Design or Creative Realisation: Interpretation and both give you the opportunity to work on an exciting project brief. Designers will develop conceptual approaches to a large dramatic text and costume makers will create a costume designed by a professional designer. You will also choose from a variety of options for your Advanced Skills unit. You can choose from an exciting range of workshops, from tailoring techniques, to digital skills, textiles, historical pattern cutting, design and build skills, costume supervising for film and theatre and finishing techniques. As part of this, you’ll attend industry masterclasses and listen to leading professionals talk about their areas of work and expertise. The final unit of the year aims to provide you with opportunities within your specialist pathway and help you develop as a creative designer or interpreter with high aesthetic standards and strong technical ability. This unit offers many live project briefs, including working with BA (Hons) Film Production students on their films and designing for BA (Hons) Acting productions. Collaborating with other students will help you to learn by doing, extending your conceptual and creative ability, technical understanding and practical expertise. In your third year, the focus is on film, theatre and site-specific projects. Throughout Level 6, you’ll have learned how to use the skills that you have developed on the course to produce work of a professional standard within a near-professional context. The first unit, Production Practice, asks you to choose from a selection of exciting projects. 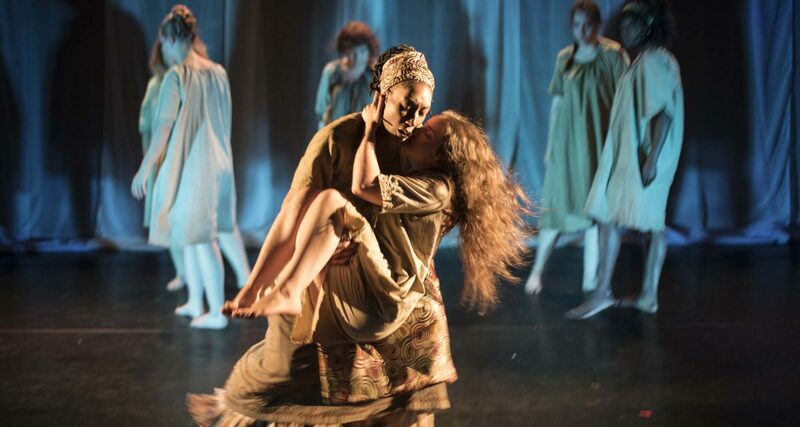 These range from designing a show that will be staged by BA (Hons) Acting students, to making a costume for a professional show, to designing a series of short films for BA (Hons) Film Production students. You’ll find the atmosphere in the studio reflects the pace and intensity of industry; we expect students to work in tight creative teams, solving problems as they occur. You’ll also prepare and write your Research Project unit in the autumn term. You’ll have the opportunity to choose your own topic for research and to complete a 5,000 word essay. The Major Project unit is designed to develop your professional skills in either making, set and costume designing, supervising or film designing. This unit can be entirely speculative – you might want to create a costume from a design that has always inspired you, or you might work on one of the many professional and BA (Hons) Acting projects that we undertake. Another key focus of your third year will be on developing your professional identity. You’ll attend mock interviews with objective industry personnel, who can help you to understand your strengths and weaknesses – and identify any gaps in your portfolio. This feedback will help you to create work that complements your existing projects, for example a maker might build a specific item to demonstrate their sewing skills.